The workhorse in the warehouse, selective pallet rack is the most commonly used racking system in the material handling industry because it is easy to install, low cost and re-configurable for future inventory modifications. 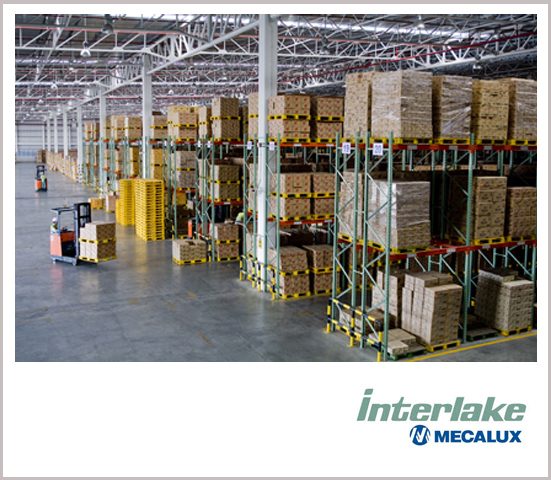 The most popular selective pallet rack systems are designed using Interlake Mecalux boltless, roll-formed high-strength steel. Racks are also available in debris resistant, easy-to-clean structural steel that is appropriate for food handling environments. Decking can be added to the beams to support product placed directly on the rack versus skid or pallet storage. Most selective pallet rack systems are 8’ – 12’ wide (suitable to hold 2-3 pallets adjacent to each other), and 42” – 44” deep though more shallow or deeper systems can be configured depending on inventory needs.